A pet makes a house a home. Frank Anthony Polito and his partner, Craig Bentley, knew this, so it was only natural that when their search for a house was documented by HGTV’s “House Hunters” a year ago, one sequence was filmed at the Michigan Humane Society. But, because they were in the process of re-locating, it wasn’t a good time to adopt. 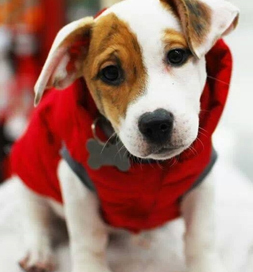 Clyde’s puffy red coat kept him warm during a cold Michigan winter. In May the show aired, and seeing the sequence shot at the humane society spurred them to begin searching on Petfinder for a dog. When Frank spotted Clyde, listed by Home Fur-Ever, a Detroit rescue group, he immediately sent a link to Craig, who was on a business trip. They agreed Clyde was the one, but before Craig returned, Clyde had been adopted. They continued to look at other dogs, but none measured up to Clyde. Then fate played its hand. Clyde reappeared on Petfinder. His adopters had a dog that wouldn’t accept Clyde so had returned him. Frank and Craig went to an adoption event to meet Clyde. “We looked around the bunch … and then we saw him, sitting quietly in his cage, looking so sad with his beautiful brown eyes downcast,” Frank says. Another family seemed interested in him, and Frank’s hopes fell. He was almost afraid to interact with the dog for fear of getting too attached. They filled out an application, and the wait began. Next came a home visit, and they were apprehensive. They cleaned house and dog proofed it. Still they worried. Would it pass muster? It did, and five days later Clyde was theirs. “Like parents of a newborn baby … we couldn’t believe someone was just giving us this wonderful creature to take home and call our own,” Frank said. Clyde’s new life is chronicled in The Daily Clyde.